← WBT Mary Poppins Practically Perfect! Child Actors Charm Supercalifragilisticexpialidosiously Lauren Blackman Soars Splendidly as Most Practical Nanny! 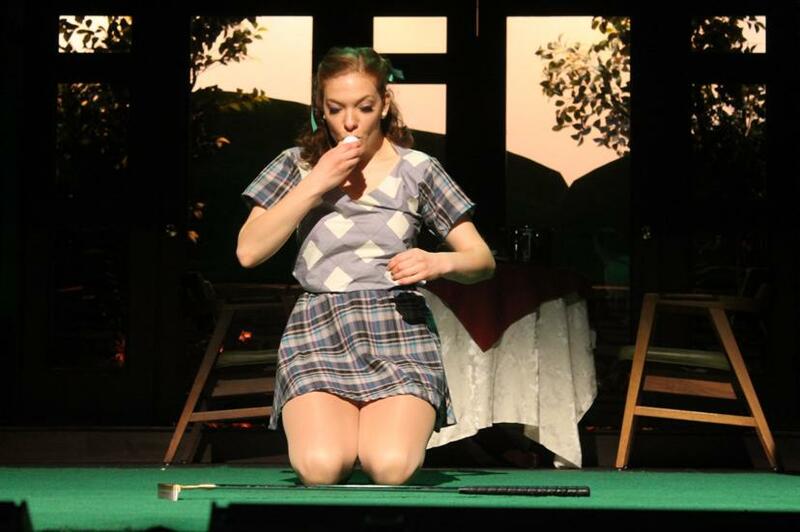 He can now marry crazy redhead waitress sweetheart, Louise, played by manic, emotive, over-the-top excitable girl, funniest actress I have seen on stage in some time: Susan Slotoroff. Justin gives his mother’s engagement ring to her. 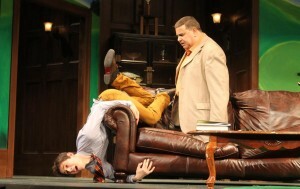 The two go crazy on each other on the sofa in the middle of the Quail Valley Country Club Tap Room. The big tournament between Quail Valley and arch rival, Crouching Squirrel Golf and Racquet Club, run by the “evil” Dickie played deliciously devilishly by Cordell Stahl whose golf fashions spoof the obsession for looking good on a course is coming up. 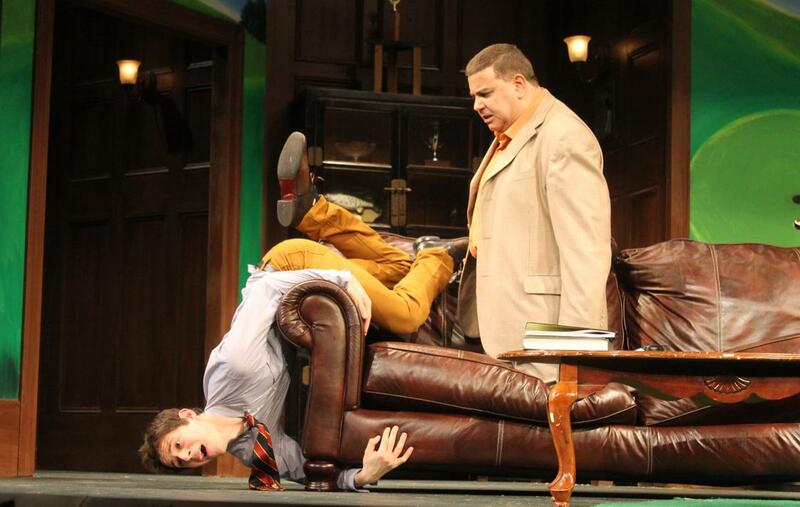 Jorge Acosta as Bingham, catching Justin (the rubber mugged, athletic, wild man Nick Piacente ) in an awkward moment. The young lovers are steaming up the couch, and are caught clinched by the shocked President of the Club, Mr. Bingham, played with bluster, blabber and pomposity by Jorge Acosta who is outraged. The steamed-up couple cowers behind the leather cushions, the audience’s collective jaws drop and incredulous laughter peels forth, eager for whatever comes next in this wild-tee-shot-down-the-fairway-slicing-hooking-delighting-quipping-after-quip-bouncing-after-bounce-and-in-the-hole comedy! 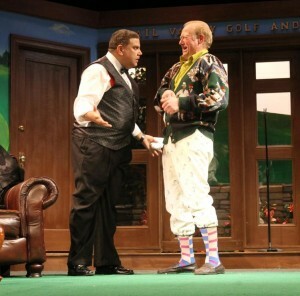 There’s lot of joy on the golf course in this creatively staged, outlandishly plotted play spoofing the testosterone of rival golfers, snobbish country clubs and the foibles of man-woman relationships consummated, longed-for, regretted, hoped for, never-forgotten. 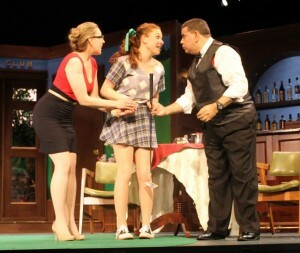 Yes, those in search in lust for pure laughter without a message, this is the show for you! 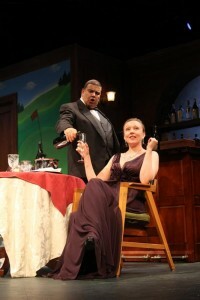 The on-again off-again sweet hearts Mr. Piacente and Ms. Slotoroff fling themselves about in breathtaking bounces off furniture and bars, chase each other, fight and lose their emotions in over-the-top style not seen since Sid Ceasar and Imogene Coca. From losing her engagement ring down a toilet and trying to hide it from Justin to Justin saying he would not trust her with his car. It’s the fragile emotions that romance has to negotiate exaggerated to laugh-out-loud max. But the future is not only rocky for the lovers, it’s rocky for the club. Dickie, played with “Snidely Whiplash” villainous glee by by the sartorially splendid Cordell Stahl, scheming Crouching Squirrel club owner, has spirited away Quail Valley’s top golfer to steal the upcoming club tournament clash. Acosta, as Quail Valley Club Pres, summons up all his pompous pride and testosterone, bets Dickie $200,000 plus ownership of the Quail Valley club and his wife Muriel’s antique shop his club will win the tournament. Confused? Bewildered? Incredulous? It’s the good stuff , over-the-top, forget-your-troubles farce is made of! You’ll never get upset with a golf shot again after you see this baby. Well, turns out Justin is so ecstatic Louise has agreed to marry him that Quail Valley Pres spots him booming drive after drive down the fairway with the help of trim, worldly wise, no-nonsense club executrix, played with sophisticated practicality by Amanda Renee Baker as Pamela, he realizes Justin can salvage the tournament. Realistic “Golf Channel quality” club tournament announcements played flawlessly over the sound system,uniquely create the tournament progress. The audience is treated to the Tiger Woods perfection of Justin, who winds up leading the tournament after 17 holes. It’s the most exciting tournament you never see thanks to the sound effects. But hold on! Louise is mad at Justin. And he falls to pieces on the 17th hole as rain stops the tournament. Dickie (Cordell Stahl) and Muriel ( Marianne Matthews) rekindle their long lost affection at the Country Club Tournament formal. Bingham’s wife, Muriel comes on to the scene furious her antique shop is hanging in the balance with Justin a basket case over Louise’s refusing to marry him. Pamela reveals her love for Bingham, and Dickie, sporting an ever changing golf wardrobe that will make any golf togs aficionado’s mouth water, rekindles his old love for Muriel played with a Bronx accent to die for by Marianne Matthews. Amanda Renee Baker as Pamela, plots devilishly with Jorge Acosta as Quail Valley Club President on how they will convince Justin to play the final hole….and suprisingly find they have a lot in common…reminiscing leads to what do you think? Then Nick with one hole to play breaks his arm. Who can save the Quail Valley Country Club? Pamela, ( Amanda Renee Baker) Club Treasurer, (a delightful partner in crime with Bingham(Acosta) Convince Louise to play one for the Quail Valley club. Can Louise, who is a fair golfer herself, save the Quail Ridge, and how come her birthmarks are the same as Pamela, the club Treasurer? What is going on here? You even get the high drama of one last dramatic putt by Louise. It’s a 90 footer with a double break, will it go in? The staging of the final putt of the tournament is fabulously choreographed, as every twist and break has the audience on the edge of their seats, as the whispering voice of the tournament announcer delivers every nuance of the long twisting roll. You’ll have to be in the gallery in either of the next two weekends of performances to find out the answer. Does everybody get together in the great tradition of The Importance of Being Ernest and Noel Coward’s Private Lives? Jeremy Quinn, Artistic Director and director of this show has nailed the timing down of all the performers who work together—time their lines perfectly. The bodies are flying around the big stage in a complexity of motion that glazes the audience’s eyes and keeps the laughs on coming . 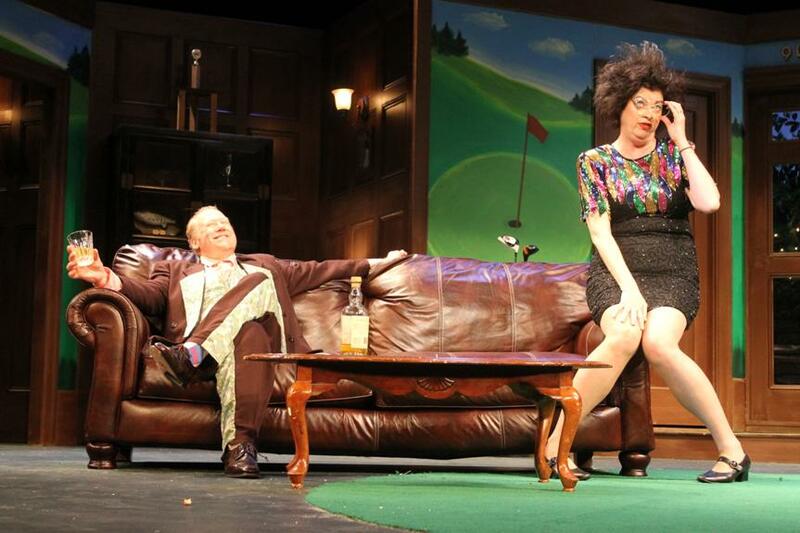 The set by Dana Kenn is old Tamarack Country Club out of Twisted Foot. Duffers and scratch golfers will feel right at home. Sound effects by William Neal use bull horns, feedback, and filtered crowd noise of clapping and crowd reactions, are intricate, realistic ,precise and the sounds are just as much actors as the comic virtuosos capering on the stage. Quinn has mixed all the many tools White Plains Performing Arts Center offers the director to send up golf in not a mean way but a bizarrely reverent way – the essence of farce.